Many Egyptian gods are represented by animals and have great powers. The Egyptians would draw people from the front with their heads and legs in profile. What would you look like as an Egyptian god? Their alphabet had thousands of hieroglyphs. Try to write your name using a simplified version of their alphabet. Their canopic jars, death masks, coffins and sarcophagi were all decorated elaborately and works of art. 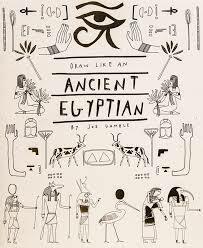 They had many styles, and with this book you can try to design your own! This wonderful book is wholly interactive, from the black-and-white line drawings intended to be colored by the reader to the variety of artistic prompts. The prompts range from blank pages with suggested material based on the previous page to outlines of death masks or scrolls to write on. The book provides a good general introduction to Egyptian art and its many varieties and forms, as well as some of Egypt's history. This book would be great for entertainment, supplementing other Egyptian learning, or as an introduction for younger kids. The illustrations and text are approachable, with most of the unusual works explained clearly.